The other day, Mathan posted a comment asking if I'd ever seen Japanese Pesos. This is the money that was printed by Imperial Japan for use in occupied Philippines during World War II. My grandfather was a supply officer on an aircraft carrier in the Pacific and brought home a small collection of bills that interested him. Perhaps you noticed, this blog has a number of readers from the Netherlands, so instead of posting a Peso, I've decided to post a half guilder from the occupied Dutch East Indies. How much was a 1/2 Gulden worth back then? Is your spelling correct or is the spelling on the note wrong? 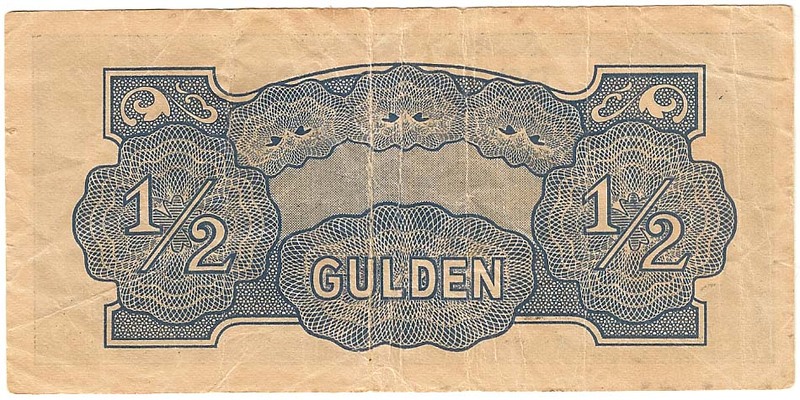 Guilder is the English translation of Gulden, both spellings are correct in their respective languages. The Japanese occupation is a black page in Dutch history. 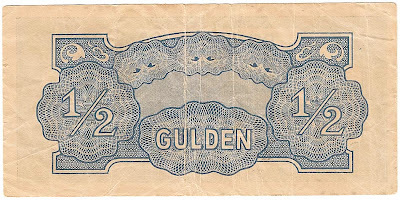 ‘Gulden’ is derived from the word golden (initially the gulden was probably made from gold). I am not sure how much a 1/2 guilder would be worth in East Indies, but in Holland its present value would be about 6 dollar.